The Tampa Bay Bandits and San Antonio Gunslingers both had 1-1 records as they met in a United States Football League game on March 10, 1985. 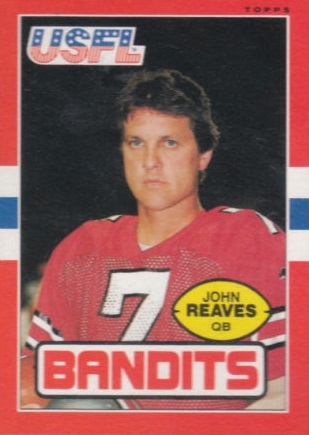 The Bandits, coached for the third year by Steve Spurrier, blew out Orlando in the first week but gave up 50 points in a loss to Houston in Week 2. They featured a potent offense directed by QB John Reaves, who had just turned 35, and the all-around skills of RB Gary Anderson, who was adept both as a runner from scrimmage and receiver out of the backfield. But the defense that recorded eight sacks against the Renegades fared poorly against the explosive Gamblers, not helped by the special teams giving up two kick return TDs. San Antonio, a low-budget operation coached by Jim Bates, was defeated by the Memphis Showboats in their opening contest but narrowly prevailed over Arizona in the next contest in which QB Rick Neuheisel played well, as did the tough defense in successfully coming from behind. There were 21,822 fans in attendance at Alamo Stadium. On John Reaves’ second pass of the game, CB Charles Armstead intercepted for San Antonio and returned it 28 yards to the Tampa Bay 34. The Gunslingers weren’t able to move on offense, with a pass deflected on first down, the next broken up, and the third falling incomplete. They settled for a 40-yard Nick Mike-Mayer field goal for the early 3-0 lead. The Bandits came back to go ahead on a Reaves pass to WR Eric Truvillion that covered 32 yards and Zenon Andrusyshyn added the extra point. Still in the opening period, San Antonio responded with another Mike-Mayer field goal, this time from 30 yards that narrowed the margin to 7-6. In the second quarter, Reaves, who was consistently hitting his receivers, went long to WR Steve Carter for a 54-yard TD. Andrusyshyn again converted to make the score 14-6. The Gunslingers put together a drive that concluded with RB Scott Stamper diving into the end zone from a yard out. They tried to pass for a two-point conversion but failed and the Bandits remained in front by 14-12. Late in the perioed, Tampa Bay put together a long drive of 63 yards in 13 plays. With ten seconds remaining on the clock, Andrusyshyn booted a 22-yard field goal and the Bandits took a 17-12 lead over the tenacious Gunslingers into halftime. San Antonio had managed to keep the game close in the first half, but the Bandits finally took control midway through the third quarter when CB Warren Hanna intercepted a Neuheisel sideline pass and returned it 78 yards for a touchdown. Andrusyshyn’s point after made the score 24-12. Fred Mortensen relieved Neuheisel at quarterback, but with not much more success on offense. The visitors added to their lead early in the fourth quarter when Reaves again connected on a scoring pass to Truvillion, this time from three yards out, and Andrusyshyn’s extra point gave the Bandits a comfortable 31-12 advantage. San Antonio finally got on the board again with 6:48 left in the contest as Mortensen ran 10 yards for a touchdown. Once again the home team tried for a two-point conversion, and again they failed, but it was of no consequence as the Bandits won by a final score of 31-18. Tampa Bay had the edge in total yards (409 to 277) and first downs (21 to 14). The Bandits also had two sacks, to San Antonio’s one, but also turned the ball over four times, to three suffered by the Gunslingers. John Reaves, who completed 12 straight passes at one point, was 25 of 31 for 298 yards and three touchdowns while giving up the one early interception. Eric Truvillion had 8 catches for 130 yards and two of the TDs. RB Gary Anderson rushed for 80 yards on 20 carries and also accumulated 5 pass receptions for 31 more yards. For the Gunslingers, Rick Neuheisel was successful on just 8 of 22 throws for 101 yards and gave up two interceptions. Fred Mortensen had about the same level of success, completing 8 of 14 passes for 85 yards with one picked off. RB Don Roberts was the leading receiver by far with 7 receptions for 124 yards. Scott Stamper topped the rushers with a modest 24 yards on 9 attempts. The Bandits won four of their next five games on the way to a 10-8 record that placed fifth in the Eastern Conference and earned a spot in the playoffs. They lost a close contest to Oakland in the Quarterfinal round. San Antonio lost its next two contests and, mired in organizational problems, finished at 5-13 to rank sixth in the Western Conference. John Reaves had a highly productive season, completing 56 percent of his passes for 4193 yards, which ranked second in the USFL, and 25 touchdowns, but he also gave up a league-leading 29 interceptions. Gary Anderson ended up leading the club both in rushing with 1207 yards but in pass receiving with 72 catches, for 678 yards, and scored a total of 20 touchdowns.